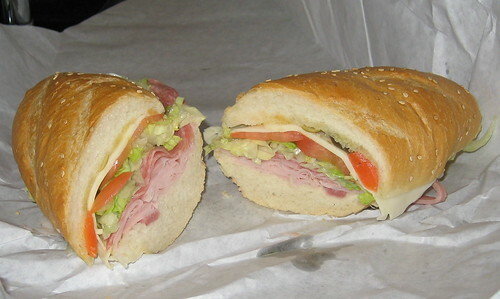 The Vinnie Special has ham, salami, lettuce, tomato, oil, oregano, provolone (I think), and I add hot peppers. It’s served on a sesame roll and the 9″ is only $5.50. Hey, don’t get me wrong, the Vinnie Special is a damn good cold meat sammy, but it can’t compare to the flavor and texture of the Prosciutto and Mozz. You know from my last post on Vinnie’s that I think it’s great and this sandwich re-confirmed this fact. It actually pains me to put this sandwich in last place, but it is matched against a true champion. The sesame roll is good but I prefer the standard Italian roll. The ham and salami are flavorful and plentiful, but can’t compare to the prosciutto. In the end, it was not a tough decision. I did find out some new info on the place. I think the owner’s also own the Ace Hardware store right next to it. That’s cool. In fact, that’s going to move it distinctly rightward on the C-P Matrix because joint ownership with a hardware store is clearly a key ingredient of cool. My mouth is watering for the next excursion to Vinnie’s, but there is no rush because they only have 11 sandwiches. That means I may have to double a month or two, but we’ll get there, don’t worry. Posted in food on 2007/04/03 by John.